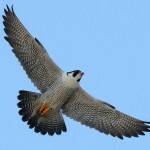 There’s a new falcon in town! 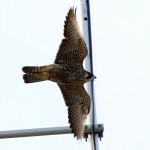 For the last month or so, the Rochester Falcon Watchers have been keeping their eyes on a juvenile Peregrine Falcon that has been seen hunting off of buildings along the Genesee River north of downtown Rochester, NY. 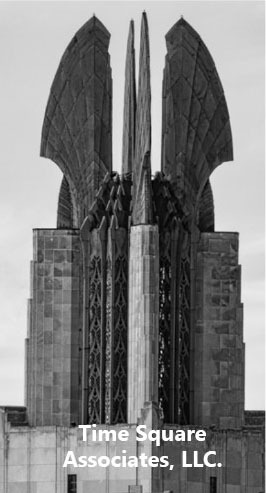 There have been many pictures taken, but until now, its identity had eluded us. 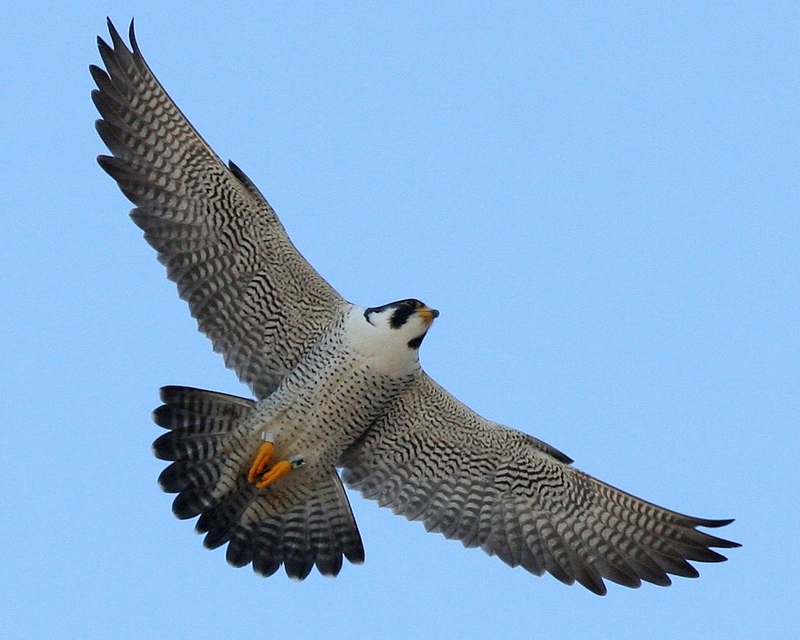 On Wednesday afternoon, October 9, 2013, Rochester Falcon Watcher Dana Mulhern was out checking the area around the Charlotte and Summerville piers, where the Genesee River empties into Lake Ontario. 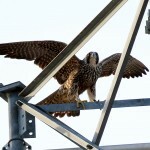 She spotted a juvenile Peregrine Falcon on top of the tall antenna at the Coast Guard Station on the Summerville side. 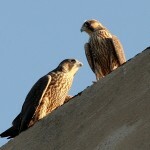 Dana tweeted out that she had spotted the falcon and fellow Watcher Carol Phillips joined her. 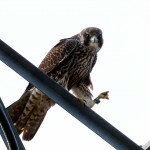 For close to three hours, they watched the falcon hunt from the antenna, stooping on ducks and gulls along the river and chasing pigeons. Their patience paid off. 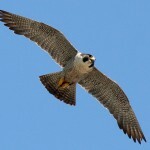 Dana was able to get a picture that clearly showed 77 Black over AX Green on the band. The picture was shared with our friends at the NYS DEC. Joyce Miller and Dana recognized the band #’s as ones possibly being used in Buffalo, NY. So Joyce also sent an email to Connie Adams from the Buffalo DEC. She got back to us today, and it was really good news! 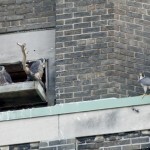 Billy, is a 2013 female hatched at Central Terminal in Buffalo, NY. 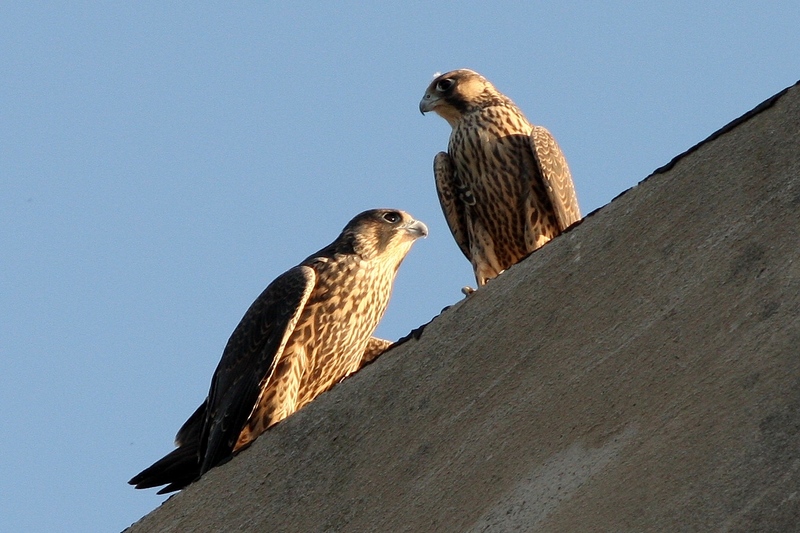 So, why are the Rochester Falcon Watchers so excited? Billy’s parents are Gleig and Diamante. Diamante hatched on top of the Kodak Tower in 2008. He is the son of Mariah and Kaver. So Billy is Mariah and Kaver’s granddaughter! Also, she is Pigott’s niece, since Gleig and Pigott are sisters. 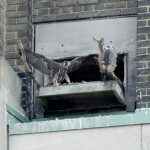 What a small Peregrine world we live in! 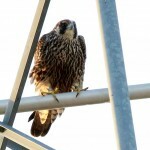 We here at Rfalconcam would like to thank all the Rochester Falcon Watchers who are out every day and reporting what they see and to Dana for getting the picture that allowed us to be able to ID this young falcon. Also a big thank you to Connie Adams of the NYS DEC. 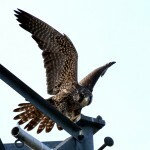 It is always good to see a juvenile doing so well. 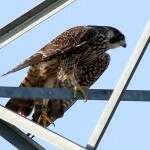 We have lots of pictures to share thanks to Rochester Falcon Watchers Dana & Joyce. 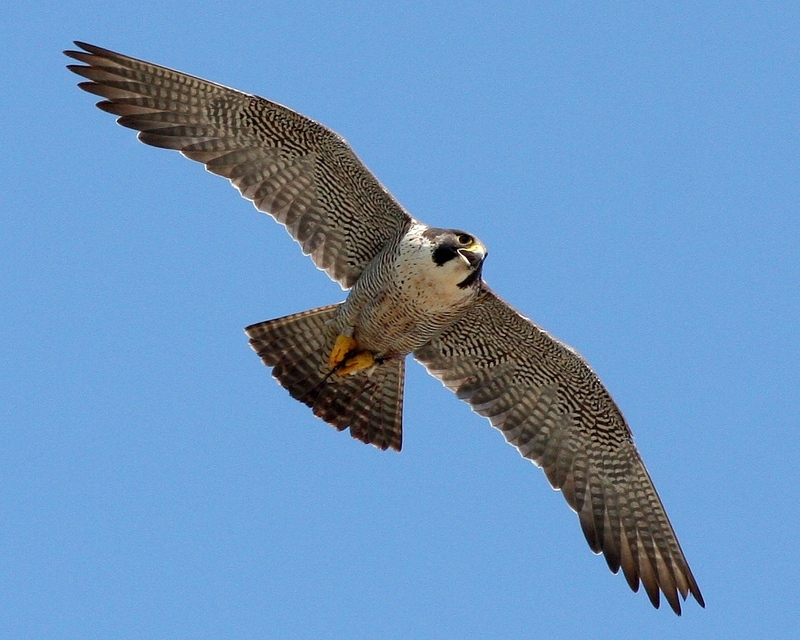 You are currently browsing the Imprints blog archives for October, 2013.